An elevation or flat bump on a bone, usually for muscle attachment. A rounded projection on a bone (usually at the end of the bone), usually for articulation with another bone to make a joint. This is your big toe. Arch formed under the base of the metatarsals i.e. under the ball of the foot. The arch that runs from the front to the back of the foot on the medial aspect. From the Calcaneus to the distal metatarsal’s commonly referred to as the arch that is fallen. Fibromyalgia also known FM or FMS is a chronic condition which causes pain in the muscles, ligaments and tendons of a person along with certain pressure points across the body. This pain may then lead to sleep difficulties, headaches, irritable bowel syndrome and muscle stiffness. Superficial Tissue is the area closest to the skin. Mostly primary layers, not deep to the body. Deep Tissue refers to any tissue: Fascia, Muscle etc. below the surface in the area furthest from the skin. Consultation is an in-depth discussion between the client and the therapist to discuss where they are at, and to talk about the client’s needs, requirements & health history to determine the best way forward in terms of treatments: Type, Frequency & Spacing. Possible contraindications will be a topic of discussion, typically a client will be given a list of major Medical contraindications (which may require permission from a doctor to proceed with treatments) or Restricted contraindications (which may require client to sign a disclaimer form to proceed) e.g. Connective Tissue Massage (CTM) is a term referencing massage of soft tissue by stretching, bending, gliding, torsion, kneading, twisting, pulling or dragging to release fluids trapped in between the skin & muscle fibres. It can be superficial or deep. Compression is a massage technique used to apply pressure on the soft tissue to squeeze muscle & fascia against the bone to stimulate blood and lymph flow. The therapist may use the heel of the hand or fist to apply the pressure required. This technique is most often used at the beginning of a massage to soften and warm up an area. Cellulite is a type of fat or adipose tissue stored under the skin may cause a dimpling or puckered appearance visually textured like the surface of a golf ball. A Toxin is a product harmful to the body which may originate from within the body e.g. lactic acid as a by-product of exercise; or from outside the body. e.g. pesticides sprayed on fruit or vegetables. Toxins are stored in the body but can be released. Massage, exercise i.e. movement and water all help the body to release toxins out of the body. Vibration is manual or mechanical stimulation intended to move soft tissue in a rhythmic fashion to soothe or distract the nervous system. Soft Tissue Release (STR) is a massage technique which combines pressure & passive movement in order to cause the nervous system to relax and release muscle fibres which may have been shortened. Stress is anything which causes a perceived threatened reaction in our body or mind. Positive stress can help us perform better e.g. adrenaline heightens our senses OR negative prolonged stress can contribute to a pattern of worry or panic. Neuromuscular Technique (NMT) is a massage technique most used in Sports Massage to break down a knot/work on a trigger point. It is essentially a compression of the soft tissue against a bone or bony protrusion ALWAYS working within the client’s pain scale of 7/10 or 8/10. When the client takes a deep breath at this point, the nervous system may then release. Muscle Tone is used to refer to the degree of tension or contraction in muscle fibres, giving the overall shape or definition to the muscle. Muscles may be hypotonic or hypertonic…..too loose or too tight/tense. Percussion is a massage technique which is extra stimulating. The therapist uses fast, brisk, maybe loud movements with his/her hands intending to wake up the nervous system, and re-energise an area. Sometimes the effect on the skin can be mottled. Petrissage is a massage technique which may follow effleurage. It is a stimulating action involving the manipulation of muscle, skin and fascia. Smaller areas are worked in twisting, turning bending movements to encourage the soft tissue to release stickiness, and break down tension built up unnecessarily between layers of muscles and fascia. Due to the effect on the nervous system, it may not be as soothing or relaxing as effleurage in areas of adhesion or scar tissue. The therapist may use forearms to apply bending and gliding torque in areas where it is suitable. Effleurage is a massage technique performed by the therapist at the beginning of a treatment in a gentle, slow, sweeping movement to warm up an area, and introduce touch to the skin of the client in a non-invasive and non-threatening way. Large areas are covered in one sweeping movement with oil applied to improve glide and reduce friction. Blood flow is encouraged superficially to the surface of the skin to warm the soft tissue and prepare the area for deeper work. Carrier Oil is a neutral oil which may be blended with another oil for aromatherapy. Contraindication is any reason why the treatment may NOT TAKE PLACE. Generally this is intended to protect the client from possible adverse reactions from the therapy in question. This term refers to circumstances when massage is NOT recommended. If in doubt, please consult your doctor. Champissage is a percussion massage technique uses to invigorate & stimulate lymph and blood along the soft tissue. Generally used towards the end of a Swedish massage to redistribute any Lactic Acid which may be released during the massage. It is performed in a fast movement with the hands held in a prayer like fashion left then right one hand at a time. Blood Pressure is a measurement of the force exerted on the blood vessels of the heart as the blood moves along. If a client suffers from hypertension i.e. high blood pressure, or low blood pressure i.e. hypotension, the therapist needs to know this and will decide how to adapt the treatment accordingly. The client may need permission in writing from their doctor in order for the massage to take place or the client may be asked to sign a disclaimer. If the client has very high blood pressure they will be contraindicated from having massage. See List of Contraindications. Aromatherapy is a therapy which uses oils/smells to improve client’s physical and/or emotional well-being. After Care Advice is information given to the client about the effects of the treatment and the possible reactions which may or may not occur including but not limited to sleepiness, thirst, changes in digestive patterns, more vivid dreams etc. Passive Range of Movement (PROM) is an action of a specific muscle or joint which the therapist performs with NO assistance from the client. The only client involvement is relaxing the area to allow the therapist assess e.g. the therapist may take the client’s arm and lift it to the side. Active Range of Movement (AROM) is an action which the client performs unassisted. The therapist may give demonstration of the movement which the client which he/she can copy unaided e.g. assessing AROM for the neck muscles may include the client nodding slowly. The therapist will be looking for range of angles involved, and any compensatory patterns from other muscles both up & down, left and right. There is no hands-on involvement form the therapist. The trapezius is one of the major muscles of the back and is responsible for moving, rotating, and stabilizing the scapula (shoulder blade) and extending the head at the neck. It is a wide, flat, superficial muscle that covers most of the upper back and the posterior of the neck. 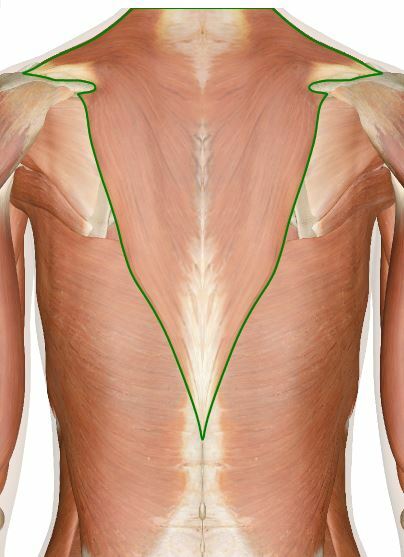 Like most other muscles, there are two trapezius muscles – a left and a right trapezius – that are symmetrical and meet at the vertebral column. The trapezius arises from ligaments at its origins along the nuchal crest of the occipital bone and the spinous processes of the cervical and thoracic vertebrae.It extends across the neck and back to insert via tendons on the clavicle, acromion, and spine of the scapula. The name trapezius is given to this muscle due to its roughly trapezoidal shape; the long base of the trapezoid is formed at the origins along the vertebrae and the short base forms at the insertions along the scapula and clavicle. The superior fibers cover the posterior and lateral sides of the neck with their tendons connecting to origins along the occipital bone and insertions on the clavicle. Just below this region is the narrow band of the middle fibers, which extend from origins along the superior thoracic vertebrae and insert into the acromion process of the scapula. Finally, the inferior fibers cover a wide region of the back from their origins along the inferior thoracic vertebrae and insert into the spine of the scapula. The functions of the trapezius are diverse and are best understood by actions of the individual bands of muscle fibers within the trapezius. The superior fibers typically act upon the scapula by elevating it (as in shrugging) or by bracing the shoulder when a weight is carried. When other muscles hold the scapula in place, the superior fibers of both trapezius muscles can extend the head at the neck by pulling the occipital bone closer to the scapula. The middle fibers work to retract and adduct the scapula by pulling the shoulder blade closer to the spine. The inferior fibers depress the scapula by pulling it closer to the inferior thoracic vertebrae. To rotate the scapula, the inferior and superior fibers work together to push the inferior angle of the scapula laterally and raise the acromion. Finally, the trapezius stabilizes the scapula to prevent extraneous movement by lightly contracting all of its fiber bands simultaneously.